Description: The park offers boating, fishing, disc golfing, hiking, picnicking, and swimming. Winter activities, including ice fishing, ice boating, cross-country skiing, and ice skating are also popular. The campground has about 340 sites. Some with 30 and 50A service. No water/sewer but they have spigots and restrooms with water close by. There also have a dump station. I had a pleasant stay here the weekend of August 19, 2017. 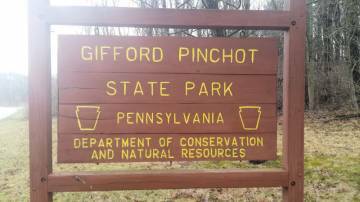 Great hiking, Pinchot Lake is beautiful, The power stayed on even during heavy thunderstorms both nights that I stayed here. It's an older campground so bigger rigs may have issues. I only have a 24 foot RV so I was good. The rangers, volunteers and camp hosts were all very nice to me during my stay.This park is south of Harrisburg and west of York, PA.
Edit- I did find out that this campground has a limited number of full hook up sites and is in the process of retrofitting a number of additional sites to be full hookup.